The Emerald Automation Controller is an open architecture high performance multi-axis motion controller designed for demanding applications that require close synchronization of up to 32 servo axes, I/O and auxiliary equipment. The Emerald Automation Controller is powerful enough to execute all of the control functions required in a production environment, thus eliminating the need for additional control devices such as a PLC. Emerald Motion Language™(EML) developed specifically for high performance automation systems, along with the Emerald Development Environment™ (EDE) programming tools, provide all that is needed to produce quality application programs for today’s advanced systems. Control up to 32 servo axes using SERCOS II master interface and compatible Emerald drives. Select from a wide power range of servomotors and inexpensive matching servo drives. Access and control up to 512 digital and analog I/O points. Designed to control high speed multi-axis production machinery. Inexpensive software tools for application development and system commissioning. Ideal for web control, synchronized cut-off, form-fill-seal, cut and seal, punching and forming applications. For use in the manufacture of metal, plastic, paper, and film products. 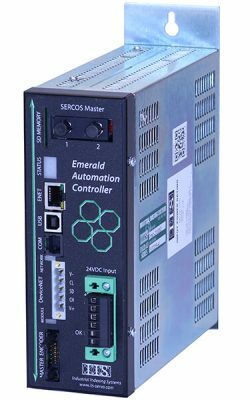 SERCOS II Automation Network: A fiber optic cable network option is available for compatibility with our Emerald Drive series of servo products. Users of a SERCOS II network will see an increase in processing power over the legacy EMC-2005 controller model. Now, designers can setup their own real-time configuration for their application using powerful “Event Interrupts.” The Emerald Automation Controller defines events as the real-time response to changes of a device state. During the controller configuration process, events are mapped to application software routines designed to perform an immediate action to satisfy the needs of the event. An event can be the result of any change in the state of any input or output device, servo drive status, timers and internal flags. Electronic gear ratio between a master encoder and motor, or motor to a motor. Versatile slave to master locking methods that are analogous to a mechanical clutch, but are programmable. Any digital output can be configured as a programmable limit switch. A programmable limit switch is defined as an output that will turn off and on at the required angle positions of a master rotating source such as a motor or encoder. Once configured and enabled by the application, the PLS function operates as an independent process in a real-time environment. Up to eight PLS engine-tasks can be operating simultaneously, each PLS engine controlling up to 16 outputs. Multiple methods are available for locking a slave function to a master position vector. Slave functions include electronic cams, electronic gear ratio, and the PLS. For convenient machine configuration and setup, the Emerald Automation Controllers use SD and SDHC memory cards to hold backup files for the operating system firmware and application programs. Standard TCP/IP port for Ethernet communication with various industry protocols provide a high speed link to factory networks, PLCs, and HMI devices. Digital input port provides line shaft encoder interface for synchronizing the entire automation system. Two quadrature A and B channel inputs, with a Z-index input, will interface to industry standard encoder devices. An additional high speed input, to access the position trap circuit for sensing a registration mark position, is standard. Universal connectivity network for interfacing to auxiliary devices ranging from simple temperature sensors and controls to sophisticated robotic systems. DeviceNet slave interface is standard, master is optional. Serial interface port available to the application program to access external text displays and color touchscreens. Executive Serial Port for software development and firmware updates from a PC. Seven segment display provides a quick visual indication of real-time operating status. IIS Emerald Technology provides a wide range of application solutions for multi-axis servo control. User's guide for the EMC-2100 Emerald Automation Controller.